Are you constructing a fitness gym? Are you constructing a fitness gym? Do you need some floor mats or complete interlocking rubber gym floor. If you need to install fitness equipment so the equipment won't damage your floors you've come to the right place. Atlantic Fitness Products carries a full line of rubber floor and floor matting available in different colored floor tiles, full mats, and even large rolled rubber floor. We carry all types of rubber floor, PVC mats and even soft wrestling and gymnastics mats. Both commercial and residential. Our selection includes but is not limited to the following: Gym Floor Mats, Indoor Cycling Mats. Folding Gymnastic Mats, Interlocking Rubber Flooring in different colors, Treadmill Mats, Elliptical Mats and Even Gymnastic Mats. 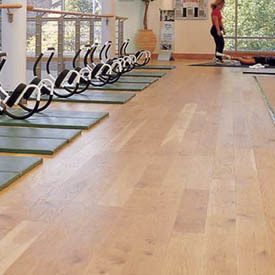 Examples of flooring available may be found at our Atlantic Fitness Flooring Products. If you need rubber flooring, gym construction, consulting advice on gyms, whether you are a home or a commercial facility in need of large amounts of interlocking or rolled rubber floor our tech will visit you on appointment at no charge. When it comes time to install your gym mats, call Atlantic Fitness we will give you a custom quote as long as it's in our service area. Please call us at 410-859-3538 or contact us via Atlantic Fitness. NOTE: SERVICE AREA DOES APPLY TO FLOORING INSTALLATION HOWEVER PRICING DOES NOT. EACH FLOORING INSTALLATION WILL BE QUOTED SEPARATELY. Some of our other services include Treadmill adjustment, Treadmill belt replacement, Treadmill motor repair, elliptical repair, and Fitness console replacement. We are certified through Stairmaster and Schwinn Fitness. Please See our service area map to see if Atlantic Fitness can install your gym floor.